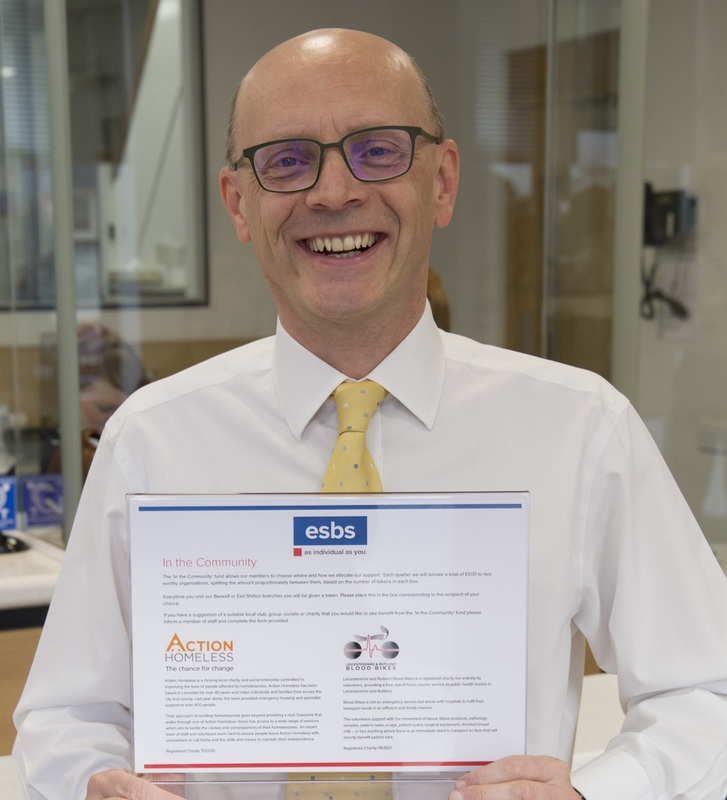 esbs has announced how funds will be split between two worthy causes after visitors to its branches cast votes using a token collector scheme. The collectors, which are in place at the Head Office in Earl Shilton as well as the Barwell branch, allow people to choose between two locally-based organisations every quarter by placing a token into the corresponding box. Now that the tokens have been counted for the first quarter, a total of £500 will be divided proportionately between two nominated charities. While £269.14 will go to Leicestershire & Rutland Blood Bikes, the remaining £230.86 will be donated to Action Homeless. Following nominations from esbs staff, the two charities that have been selected for the second quarter are Age UK Leicester Shire & Rutland (www.ageuk.org.uk/leics/), and Angelman UK (www.angelmanuk.org/) – the Society’s Charity of the Year 2018/19. The initiative is part of the Society’s ‘In the Community’ fund, which aims to support events and groups operating in the area in a pledge to be at the centre of local life. Leicestershire & Rutland Blood Bikes is a registered charity run solely by volunteers, many of whom are keen motorcyclists, who provide a free, ‘out of hours’ courier service to public health bodies across the two counties. The group assists hospital teams with the transportation of blood, blood products, pathology samples, patient notes, x-rays, patient scans, surgical equipment, donated breast milk and more. The service allows NHS teams to reduce the cost of transport, which is then re-invested back into direct patient care. A spokesperson for Leicestershire & Rutland Blood Bikes said: “We are extremely grateful to the customers of esbs for choosing to put tokens in the collection boxes to assist our charity. “The amount raised through the esbs token scheme will really help us to keep our Blood Bike vehicles on the road and therefore enable us to continue to provide our free courier service to local NHS hospitals, and Air Ambulance Service. Based in Leicester, Action Homeless is committed to bettering the lives of those affected by homelessness and has been offering its support to individuals and families in the city and across the county for the past 40 years. Visitors to any of the charity’s centres are given access to a broad range of services that aim to tackle the causes and consequences of their homelessness, while the expert team of staff and volunteers work to ensure that people leave with a place to call home and the skills and resources to maintain independence. A spokesperson for Action Homeless said: “We would like to thank esbs and their customers for their support. To find out more about Action Homeless, visit actionhomeless.org.uk, while more on Leicestershire & Rutland Blood Bikes is available at www.lrbloodbikes.org.uk/.